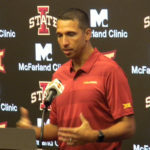 Iowa State football coach Matt Campbell has agreed to a contract extension that runs through the 2024 season. Campbell earned his second straight Big 12 Coach of the Year award after leading the Cyclones to an 8-4 record, including a 6-3 in league play. The athletics department has also agreed to provide Campbell $1 million in additional compensation this year for his assistant coaches and support staff. Over the last two seasons, ISU has committed $2.2 million in additional increases for Campbell to distribute to his staff. Part of the commitment that Iowa State has undertaken is the school’s soon-to-be-built Sports Performance Center. The $90 million, 110,000-square foot facility will include an academic and student services center, dining facilities, a sports nutrition center plus nearly 20,000-square feet of additional locker room, team lounges and gathering spaces for football. Campbell’s Cyclones were picked to finish seventh in the 2018 Big 12 pre-season poll. Their third-place finish was the school’s best in 40 years.